Good news for iPhone or iOS users who are facing trouble with their device and having iCloud lock issue. Here, I come up with any iOS tool in-box v.4.8.0. Apple is one of the most popular brands in all over the world and iOS is the 2nd most popular OS after Google’s Android. A lot of users using iOS and the number is increasing day by day. Many of the users face iCloud lock issue. And to solve this problem they have to suffer a lot. We are here to decrease your sufferings towards the issue with in-box v4.8.0 iPhone iCloud remover. Generally, whenever someone buys a phone from Apple and carries it to a different country they have to face this iCloud issue. There are many different issues as well. iPhone gives much better service than any other phones and at the same time, the price is always a bit higher than the others. When you face any kind of issue with any iOS device, to solve the problem it takes a lot of money as well. Bearing that in mind, we have come up with the in-box v4.8.0 crack. In this article, we will explore this tool to you as well as we will provide you free in-box v4.8.0 downloadlink at the bottom of this article. Let’s dive into the topic. What is in-box v4.8.0 App? In-Box v4.8.0 is a tool which is made for iOS devices to solve different issues. This in-box v4.8.0 crack runs on all windows version and it supports both 32-bit and 64-bit apple products. It is capable of unlocking an iOS device. Meanwhile, you will get IPSW, IBOOTY recovery mode and iCloud removal feature with this tool. It is mainly created for iCloud removal and save your money. As I said earlier, whenever we face any issue with our iOS device, it takes a bit much money to solve the issue. In-Box v4.8.0 made with the intention to save your money in terms of theiCloud lock. the iCloud lock was created by Apple to protect the iOS devices from stealing by the thieves and resold by them. It is only the owner who can open their iOS device by providing the credentials they got from Apple. It is really hard to break into apple’s security and apple make sure of it every time they release an update or a new device. 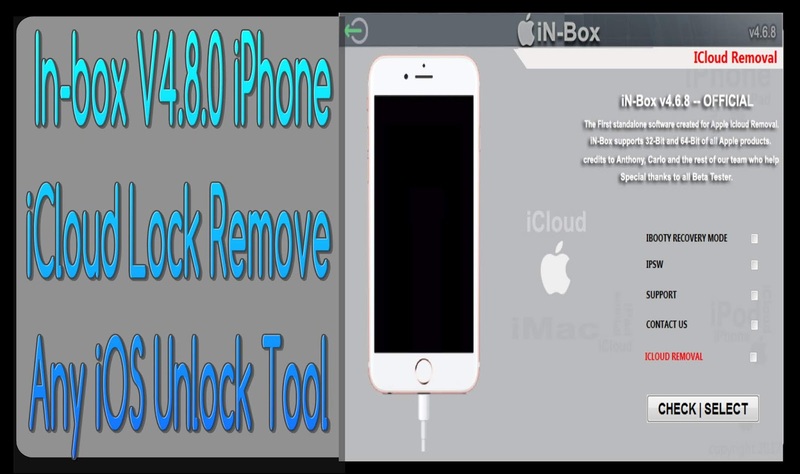 But with the help of in-box v4.8.0 iPhone iCloud remover, it is possible to unlock the iCloud lock. Let’s look at its features. License: It’s a tool of Freeware so, you may be able to always download it free. Restrictions: No further modification as well as decompile, reverse engineering, disassembling are not allowed. The in-box v.4.8.0 is really a useful app to remove iCloud on your iOS device. Its various feature made it unique and it’s easy to operate with your device. What are you waiting for? Just download it and start to take the benefit and save money. Thank you so much for reading the whole article. I hope you already downloaded the app and start working on it. If you face any kind of problem let us know. If you like the in-box v4.8.0 app share it with your friends. Take care and spread the goodness.